I've been experimenting with QR codes (2-d bar codes) with my mobile phone. 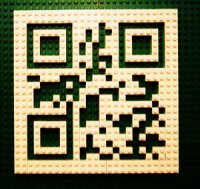 While helping my daughter assemble a Lego® spaceship, I had the random thought that maybe I could build a QR code out of Lego. Would such a QR code be readable, or would the bumps and gaps mess it up? The moment of truth... would it scan? No, not at all. The problem was I needed a border around the code block and I'd put the pieces too close to the edge. So I laboriously shifted all the pieces over and added a white border. 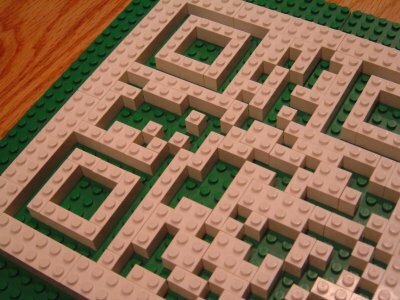 My conclusion is that Lego is a viable medium for implementing QR codes. Some tips if you try this at home... QR codes come in multiple sizes with various levels of error correction. The minimum size is 21x21 but many QR websites will generate larger ones. Avoid the larger sizes unless you want to do more assembly. 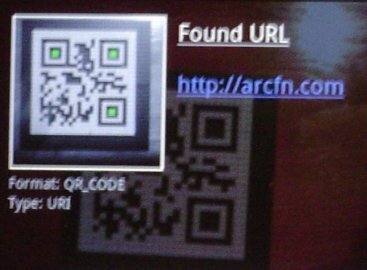 I used the Raco Industries online QR code generator since that site provides a lot of control over the generated QR code. If you print out the code with .3125" pixels, the output will conveniently match the size of the Lego blocks. Awesome! We did something similar at work... I drew a QR code on a white board with no measuring tools... the resulting image was very rough but the ZXing code was able to decode it.